Spirulina is one of the same blue-green algae as Suizenji Nori(seaweed), etc. and it is one of the oldest plants which was born on earth more than 3 billion years ago from now. It is breeding mainly in the subtropical areas such as in Africa, Central and South America, salt water lakes of high alkaline. 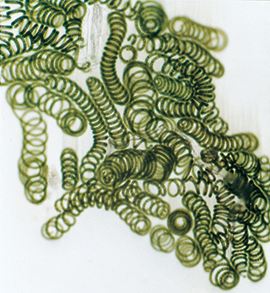 "Spirulina" is a Latin word meaning "helix", it is said to have been named because it has a twisted shape. Since there are many kinds of nutrients included abundantly, it is a convenient food as a dietary supplement for modern people who tends to take unbalanced meals. As "ideal nutritional food", NASA is also developing it as a space food. Dietary fiber, Polysaccharide, Linoleic acid, γ-linolenic acid, Inositol, SOD, Phycocyanin, Zeaxanthin, Chlorophyll a, Nucleic acid etc. Since Spirulina covers all these nutritional ingredients at once, it can be said that it is perfect healthy multi supplement for busy modern people. The nutrient content of Spirulina varies slightly depending on the season, weather, sunshine time etc. during spirulina culture. Five great nutrients in Spirulina! Starting with proteins, sugariness, fatty acids, and vitamins, and plenty of minerals such as calcium, magnesium, iron and zinc that tend to be deficient in everyday diet, that is, it contains all 5 major nutrients. Furthermore, because digestion absorption is good, these ingredients are absorbed smoothly in the body. A lot of good quality protein! Each part of our body is made of protein. Spirulina contains this protein three times as much as beef and twice as much as soybean. Moreover, protein of Spirulina is a high quality protein containing essential amino acids in a well-balanced manner. This quality meets the ideal standard of FAO(United Nations Food and Agriculture Organization). Contains 18 kinds of amino acids! 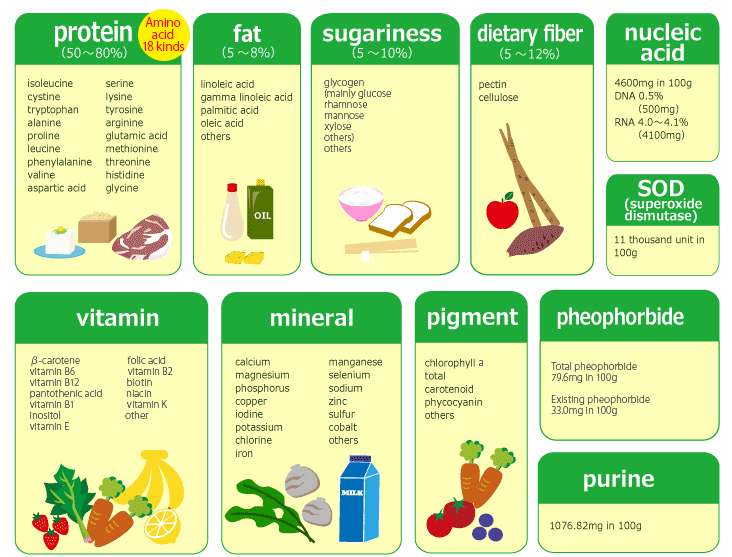 Protein is an important nutrient used as raw material for making cells, enzymes, hormones etc. in our body. Spirulina contains about 70% protein(amino acid) and it is very good quality. It contains 18 kinds of amino acids including essential amino acids and non-essential amino acids. Spirulina contains abundant natural pigments such as green chlorophyll(chlorophyll), blue phycocyanin, orange to yellow carotenoids. Chlorophyll is a component of interest that is useful not only for supporting body circulation but also as a tired body and as a care for the next day after drinking. Spirulina contains beta-carotene, zeaxanthin, etc. as carotenoids, and these natural pigments are very important ingredients for us reviewing our eating habits which tends to get oxidized. Although it seems that vitamin is included in vegetables, vitamin B 12 is rarely contained in vegetables and it is contained in animal food a lot. 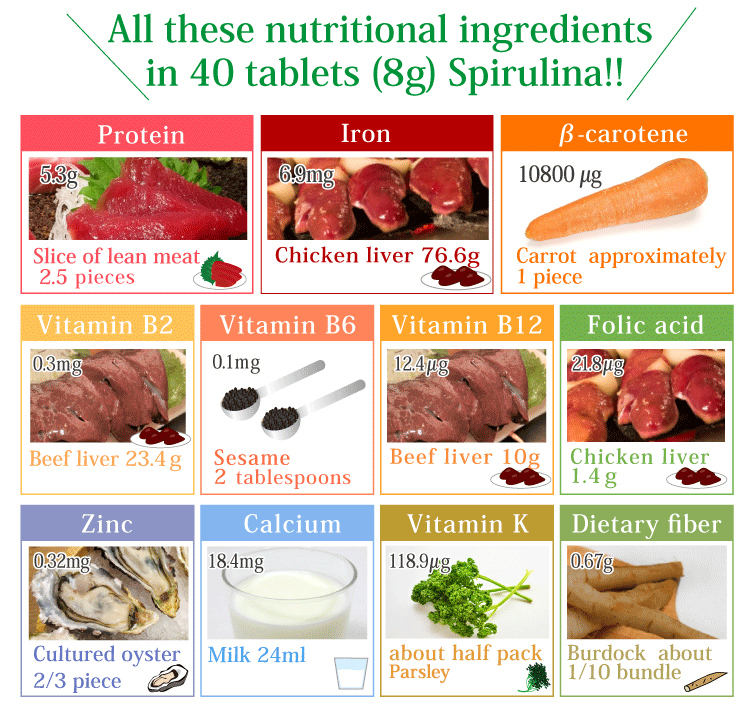 Spirulina is rich in vitamin B12 than liver and oyster. Review easily tend to get oxidized! Carotene is estimated as 5 to 15 mg per person per day for a reference amount, totaling 300g of green yellow vegetables 200g and light color vegetables 100g in vegetables! Beta carotene changes to Vitamin A only in the required amount in the body. If Vitamin A is insufficient, because it becomes a body which is likely to cause a problem in daily health, we use spirulina which contains plenty of beta carotene which is gradually converted to Vitamin A only by the necessary amount in the body. As doing that, let's look over again our eating habits which easily tend to get oxidized. Extra oil attaching to the body which is taken up in even TV in recent years. Spirulina is rich in linoleic acid and linolenic acid which clean up the troublesome thing that causes which the body goes bad as bad body circulation occurs abundantly. Especially these two components can’t be made in the body, so we have to replenish from the usual. 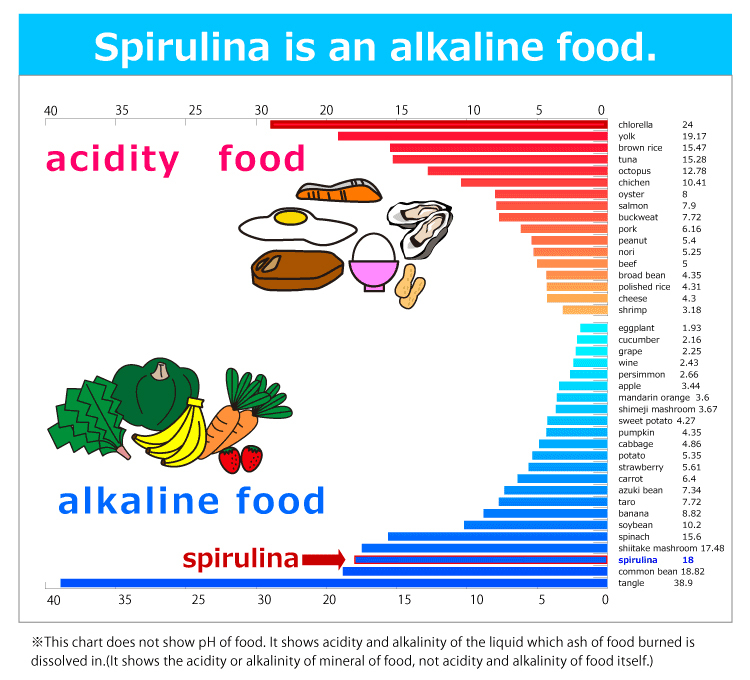 Alkaline food Spirulina is a strong ally of those who use processed foods and high fat foods a lot! In order to stay healthy every day, it is necessary to eat alkaline foods and acidic foods in good balance, but the eating habits of contemporary people who live in hectic life style tend to be biased toward acidic foods. It is Spirulina that also supports such eating habits of those people.